The Super Bowl is in 10 days…wheretheheckhasJanuarygone? I care about the Super Bowl for only 2 reasons: food and commercials. I never watch a single commercial thanks to DVR and food, well…an excuse to cook just makes cooking all the more fun! I couldn’t care less about the outcome of the game (though I’m always game – pun intended – for watching sports). My heart stretches far and wide for college football, but the NFL, I don’t really get too involved with. 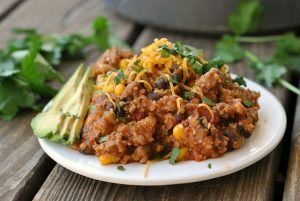 Game food made healthy, however? Sign. Me. Up. I’ll be the game time healthy snacks QB, happily! I am the self-proclaimed queen of faux fried foods, after all. Mr. Prevention confirms my mad skill when it comes to making junk food…healthier. A skill I have marriage to thank for. While I make that sound simple, recipes like this one needed some tweaking. My first attempt at Baked Mozzarella Sticks was nothing shy of a disaster. Cheese oozed from every end of the wonton and I was left with a sheet of melted cheese and wonton. Uncool. Attempt #2 was a success. I used an entire eggroll wrapper which enabled me to cover the entire mozzarella stick to prevent the cheese from oozing its way out. I also cut the mozzarella sticks in half. Don’t fret – the cheese spreads and there’s plenty of cheese to go around. These were delicious. While a bit different than the traditional breadcrumb-coated mozzarella stick, these are far healthier at 90 calories and 1.3 grams of fat a piece! If mozzarella sticks don’t do it for ya, may I suggest Oven-Fried Pickles, Crispy Baked Eggrolls, Faux Fried Calamari, “Fried” Chicken, Oven Fries, Baked Green Bean Fries, or Baked Buffalo Chicken Wings? 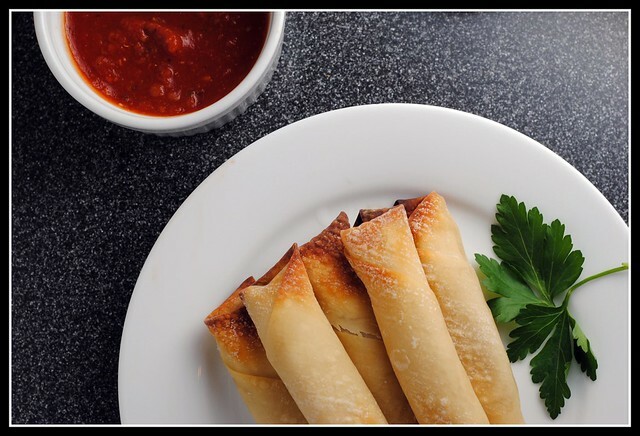 Cut cheese sticks in half length-wise so they are about 2 1/2 inches long. 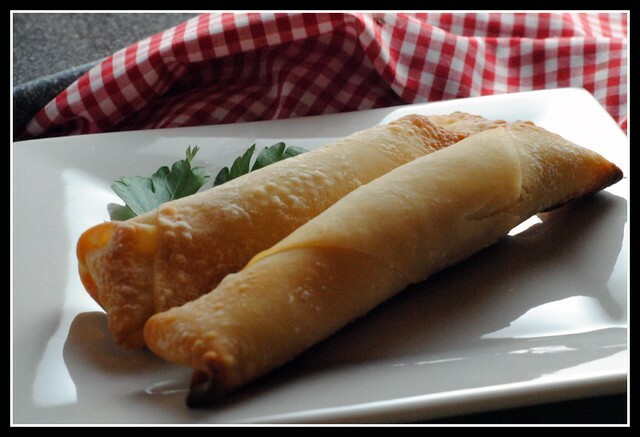 Lay the eggroll wrapper at a diagonal and put one piece of the cheese at the very corner and begin to roll into a log. At the mid-point of the wrapper, fold in each of the sides and continue rolling. Seal off the eggroll wrapper with a smear of water along the edges and rub to moisten and seal. Arrange the mozzarella sticks on a parchment-lined baking sheet and spray lightly with non-stick spray. Bake for 12-15 minutes or until lightly browned. Yield: 12 servings (1 mozzarella stick each). 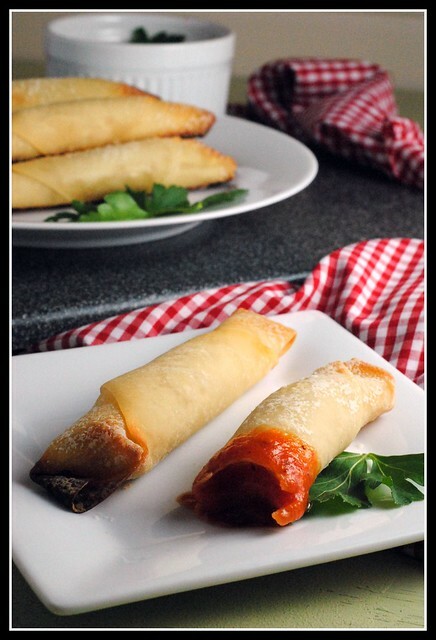 Result: Crispy and cheesy…perfect when dunked in your favorite marinara sauce! These can be made ahead of time and popped in to bake whenever needed. There’s no prep work…just rolling them up and sealing them off. 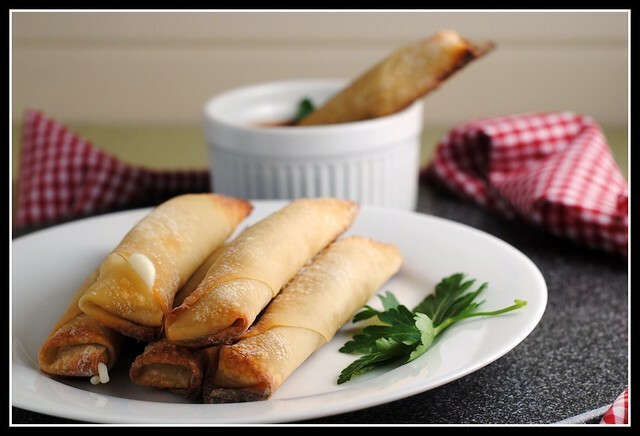 These are sure to be a hit at any get-together and a hit with the kids, too! Enjoy! Clinic, teach, clinic…massage! I haven’t had a massage in years (probably 3…) and I am redeeming a gift certificate that Mr. Prevention got me for Christmas. 😀 When I get home? Dinner will be ready…because it was assembled in the crock pot last night. Wednesday is sure starting off right! I agree. I love watching most sports but when it comes to getting my heart involved, that is set on college football. The superbowl is just a grand ol’ time full of food and (hopefully) fun commercials. Ha, the only mozzarella sticks I’ve made are deep fried – the secret is to freeze the breaded cheese so the outside doesn’t cook before the cheese is all melty – um, definitely think yours are better! I can’t do massages – I am so ticklish I just end up laughing! If someone brought those to a Super Bowl party that I’m attending, I’d probably eat every single one of them myself! Yummy 😀 I’m totally trying these. 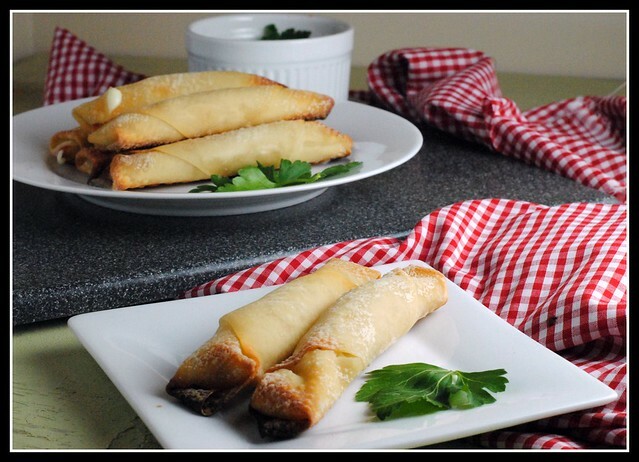 We’re not sports fans at all – which is fine – we don’t need an excuse to enjoy these 😀 Now that I know eggroll wrappers bake so nicely I’m excited to try them with more things. Mozzarella sticks are probably one of my favorite fried foods!! Thanks to you, I have found a way to enjoy without all the guilt. And I agree..food and commercials are my two favorite things about the super bowl!!! I’ve made homemade mozzarella sticks before using breadcrumbs, but never wonton wrappers! I love it! It’s less messy too! ooh yum! I’ve made fried mozzarella sticks with tempura batter which were pretty good. Love the idea of using a wonton wrapper! 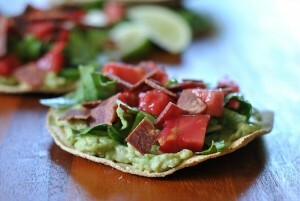 I’ve been wanting to try these for some time now…..they look yummy and easy. Enjoy your massage….deep cleansing breath and RELAX! Oh my, Nicole! This might’ve just earned its spot on my super bowl menu. I love that they’re baked! Oh, these look delicious!!! Perfect lighter fare for any gathering! My kids love these! I haven’t made them in a while…thanks for the reminder, just in time for Super Bowl! Hi Michelle! I’m sorry they were a mess! Did you roll the wrappers and seal well? Thanks, Nicole! I did seal them.. Most of them blew out in the center and a few out the sides.. They seemed to come out better when I cut the cheese in 1/2, but a few still oozed out the sides… The guys laughed, wrapped the cheese around the crunchy wrap, dripped in marinara and eat them anyway… 🙂 I WILL try again.. I always love this food, cheese sticks. Here, we usually fry it. However your pictures look very yummy, I have to try the baked one some time. Thanks a lot!